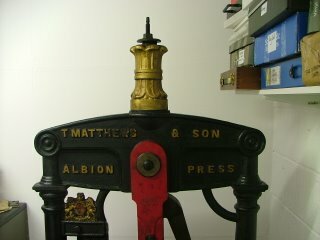 I have also worked on the new Albion press for the first time. I will soon start to describe what I have been doing on the Albion Press Restoration Blog so check it in a couple of days. There are other kinds of productivity to describe at this time of year. I sat out in the sun this afternoon and "strung" the rest of the onions we grew so that they can hang and keep dry in the garage. Earlier this evening, I foraged in the hedgerows with A to collect blackberries. We stewed these with apples from the garden and enjoyed them for dessert. I recovered the tympan of the small Albion this evening (also to be described in the Albion blog). I will put it in a warm place to dry overnight so that it is ready for packing tomorrow morning ready for editioning. The last few days have been crazy! I dismantled and moved the Arab Treadle Platen press out of the studio. I cut down my desk by 6 inches so that it would turn and sit next to the map chest to give more room. The bookshelves were emptied and removed and smaller items were stacked onto my desk. The reason? My new Albion arrived this morning. It was delivered, assembled and set-up by the guys at AMR, who I recommend highly. More details to follow but I wanted to share some photos. 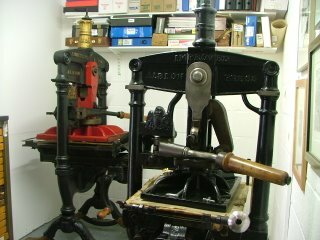 I feel I must warn readers of a sensitive disposition that the piston and platen have, at some time, been painted bright red. I was planning on repainting them but I have to say that it is growing on me and I think the colour will stay. I have christened it "Red". This is exactly what I need to print from larger blocks. However, this is the worst time for me as I have just received my final paycheck from college and my only current income is from engraving. A copy of all of the engravings that I have editioned. There are over 100 of these. Most are from the signed, numbered editions; a few are signed Artist's Proofs. All are perfect copies. In addition, I include about fifty "states" from various engravings. These are the the proofs that I take to show the stages between the first pull from the block and the final editioned image. Each "state" is numbered but not signed. I will happily sign these if you wish. In addition, I will include some of the original sketches made for engravings. There are at least ten of these. They are signed pencil or ink drawings. All of these will be placed in a handmade box and mailed to you with no mailing charge. 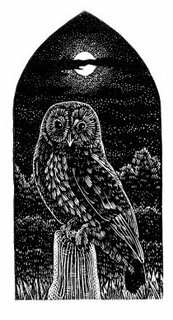 In addition, you will receive your own engraved 2 x 3 inch bookplate. The earliest that this could be delivered would be January 2006 as I already have many bookplates in a queue. I would include 100 plates. Additional plates would be charged at cost. The price for the above is £1000. Bear in mind that bookplates start at £250, and that the most expensive print included costs £120. Alternatives? 1) Make me an offer. 2) If you are rich and a very nice person, make me a gift and become a patron. 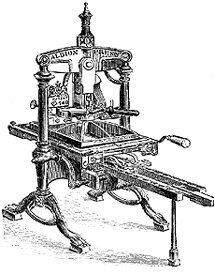 3) Pay me the above and I will create for you your own engraving (at least 4x6 inches) and print your own exclusive edition of 100 prints and also include the block and all original artwork. Email me if interested. I am interested to discuss any aspect of this. 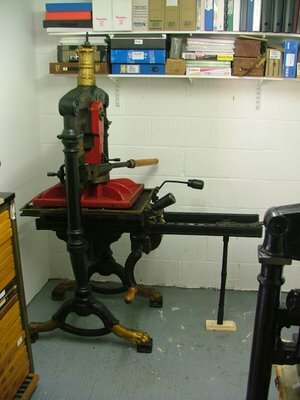 This would only pay for a proportion of the cost of the new press but it woulod certainly help. I'm off to bed to dream of Albion Presses!